The semester truly started off with a visit to local company, Ximedica. This was an inspirational experience. The ability to create a connection and tour with a local design company is highly valuable, especially since many RISD Industrial Design alumni work at Ximedica. They were also able to provide us with valuable insight into designing for healthcare and to some of the methods that they use to come up with ideas and potential solutions. This is also when we officially became a group, and were assigned to the NICU to work with Ravi. A continual struggle for our group was trying to find time to make sure that we all had our immunization records up to date in order to shadow at the hospital. After passing the first level of approval, we attended a group meeting with Ravi at the hospital. It was very helpful to gain insight about the setting that we would be operating in and ultimately designing for. Very early on, Ravi established himself as a central figure for us to consult. We could not have asked for a better mentor. After his talk about different processes in the NICU and some of the problem areas that need attention, we received a brief tour of the NICU. This was one of the most valuable aspects of the semester. Seeing babies, parents, and doctors use the space is beneficial to the design process. We took down initial observations and captured photos for studying later. Not smart enough, ultra sensitive. The idea was that we would replace the traditional Ascom system that the nurses carry around with smart devices (better and more accurate reporting/notifications) that is a wearable so that the nurses can be hands-free (via voice activation, gestural) while they are working. 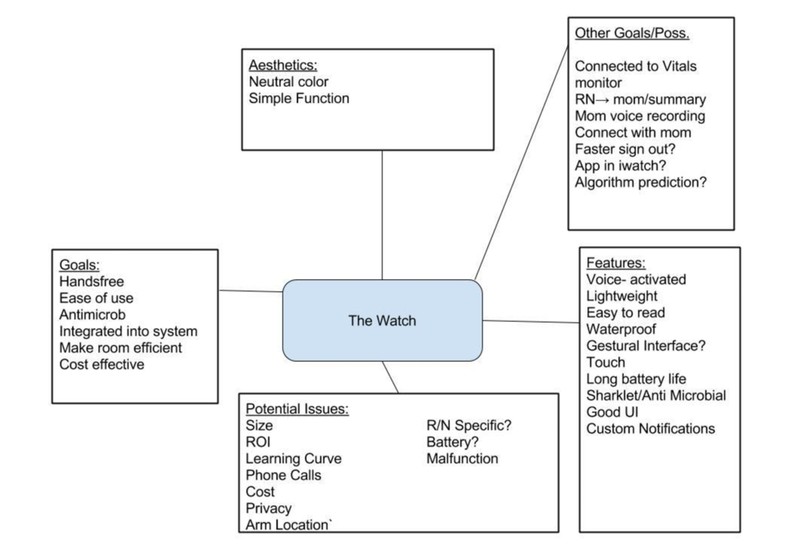 We also discussed a visual system throughout the NICU that could work with the wearable. Are there any restrictions in place that limit what nurses and hospital staff can wear on their wrists, or on their person? How is the Ascom connected to the screen and the patient’s information? What is the most important vital information that the nurse needs to be able to monitor remotely? How long does the charge last on the Ascom? In the end, we decide to change trajectory. Looking at our initial brainstorming chart we thought addressing the parent’s need for a better design space would be more interesting and impactful. Inspired by the design and function of small houses, we wanted to create a space that was not only beautiful but also multi-functional. This semester, our team worked with Dr. Wilkinson on a primary-care-related project at the Family Care Clinic affiliated with Memorial Hospital in Pawtucket. Our initial shadowing and bottom-up research of issues within the clinic quickly converged onto “the waiting room experience.” From our short, but informative, series of observations -- sitting for hours upon hours in the waiting room, and watching patients in this setting -- it became clear to everyone in our team that the character of this experience was detrimental to patient satisfaction with their physician and the broader health system providing them care. In particular, our team highlighted three issues confronted by patients when engaged with the limitations and the realities of the waiting room -- a lack of wait time predictability, a lack of mobility for patients while waiting, and a general sense of disengagement with the setting of the waiting room itself. During our observations, our team acutely noted that patients, more often than not, were using mobile devices in silence amongst each other, and that patients grew increasingly anxious as their waiting time progressed. Our design intervention sought to primarily alleviate these fundamental concerns, through two conduits: by first making the waiting experience more bearable and engaging, and by reducing the waiting time itself, by providing physicians and hospitals with data conferring them means to improve the overall workflow of their practices. We made an early decision to make our design intervention both patient- and clinician-facing, and regarded patients, nurses, physicians, and clinics as key stakeholders for our product. In the service of constructing a practical and elegant intervention which could give the patients reliable feedback during their wait, we studied the existing customs in the waiting room. Interestingly patient's preconceptions about how to interpret their appointment times led to worse efficiency in the clinic. Several patients said “I got here after my appointment time because I knew she [the provider] would be late”. This inclination to outsmart the system identified a need for trust in the feedback patients receive. We identified personal wait time devices, namely the use of infrared “restaurant buzzers” as a concept that could be adapted to the clinical setting. We wanted the implementation of these devices to piggyback on the existing practices of nurses and patients so as to avoid disrupting the workflow. As a result the feedback device, a wristband, became integrated with the office clipboard to streamline the handoff, organization and recharging of the device. Another vital consideration had to do with how to communicate time to the patient. We found that countdowns in all settings induce anxiety and require static, absolute data. A more ambiguous, graphical representation of time seemed to be a better fit to communicate volatile data such as a wait time. In order to make the graphic immediately understandable, we went with a simple tonal gradation, from dark blue to nearly white-blue. One of the key challenges we faced, as with any projects in the medical technology field, was how to make our product helpful and thus appealing to the many stakeholders involved. We often revisited our chart with the list of stakeholders and their priorities, in attempt to keep our design aligned to the needs of the patients, nurses, physicians, and clinicians. We decided that in addition to the physical wristband technology, analytics were critical components to the overall design of the system. A two-way exchange of information, where the design could collect, retain, and present collected data, and provide feedback on them to the nurses/clinicians/physicians, could potentially ensure another depth to the positive long-term influence the product could have in the future. A lot remains to be discussed. With any wearable technology we must raise the question of what a user’s experience might be when wearing a hospital sponsored wristband. Level of comfort, stigmas, hygiene, and mental associations are a few topics we will be looking into. How can we then better connect the different services provided by the hospital especially between the ER, case management, and the discharge process? How can we better coordinate between different services to better triage and provide resources in a timely fashion? If this process is more transparent, consolidated, and interconnected, perhaps then these frequent visitors could be more efficiently helped and free up necessary time for doctors. For better and efficient connection among the ER, case management and discharge process, we began to ideate the potential solutions on creating an interface that recognizes the Frequent Visitor from a triage process and further classifies which type of Frequent Visitor a patient is under the patterns that are built in Epic system or a similar system. In order to have better understandings on Frequent Visitors and possibly create categories, we studied more about them through more interviews and literatures. However, most of studies on Frequent Visitors have identified the patients with health issues that are substance abuse related, mental health related, chronic and complicated, and the patients with social needs are clearly classified. Finding these facts, we turned our ideation to create a tool that helps staffs to identify problems of Frequent Visitors efficiently and tracks their behaviors for potential studies on them. We thought about prototypes that will help the patients to get their core needs through a board game to an app-based or electronic based settings, yet we received feedbacks on their potential disadvantages, which they rather disencourage interactions and conversation between providers and patients. Therefore, our idea became a survey type that leads both patients to clear their stories and providers to earn the stories in depth and insightful. We create our prototype, STORYBOX, in a form of box that unfolds, and each side of box has questions to write and tactilely interact. We hoped it to be a low cost and reusable in order to reduce its costs and easier to replace in case of any loss, damages or stolen. Then, in order to restore the interaction between patients and providers and track the stories of patients, we create a potential app interface for provider’s side. We temporarily named as STORYBOOK, accompanied with STORYBOX; it has two steps to record the stories gathered from patients and STORYBOX. First, the nurses will ask and record stories based on the questions that are given in the STORYBOX, and then there is another tap for a case manager. In the tap for the case manager, there will be lists of resources such as food, shelter, utilities and insurances that are available locally and spaces to write the goals and case notes. Especially, case notes can be rewritten each time the patients revisit, and each is saved as a list, or a history. Finally, we thought about creating an alert system that tells the incoming patient is a Frequent Visitor from an Epic system. We set if someone revisits four times in five months, then the alert to be shown. Then the alert can be link to our app, STORYBOX. From our main prototype, STORYBOX, we added supplementary systems for easier and more direct uses. Our project is at the point where more implications or developments can be made through tests from the users, including the hospital staffs at ED and patients as well.